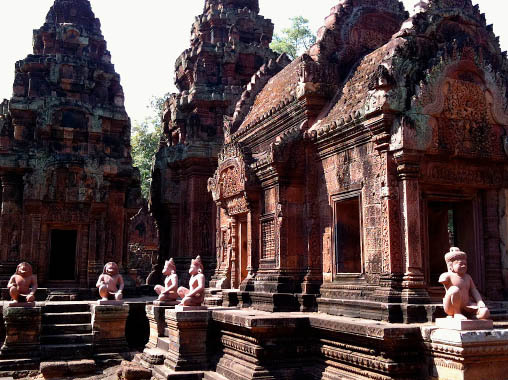 While visiting Cambodia, here are our presents for best 10 temples that you should not be missed. 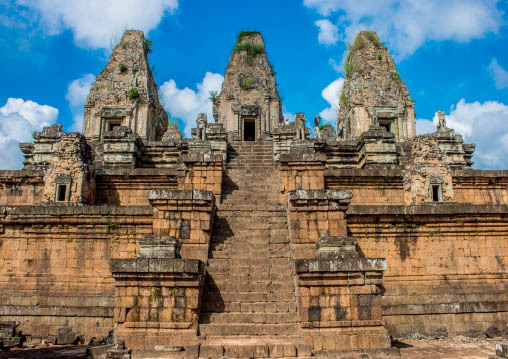 Those temples remains as on the of the most famous tourist attraction in Southeast Asia. Hundred of temples were built centuries ago which symbolise for social power of ancient empire, religious and political. Located in the area of almost 200ha, surrounded by a lake – Angkor Wat is the most beautiful temple and the largest in the Angkor Complex. Built in 12th century during the reign of King Suryavarman II, It is symbolises for traditional Khmer temples and architecture with beautiful carvings around the temple. 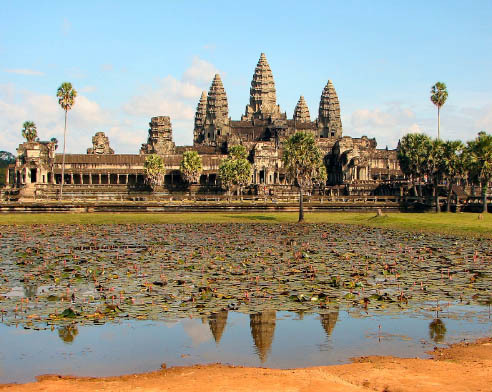 By the end of 13th Century, Angkor Wat changed from Hindu to a Buddhist temple. 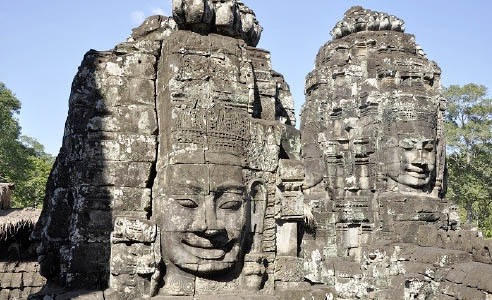 Angkor Thom was the last capital and well – known as the great city and the longest during Khmer empire. It consists many temples which were built by Jayavarman and his successors in the end of 12th century. The Bayon temple was located around Victory Square, in the middle of the complex. Bayon Temple is part of Angkor Thom expansion. It was built by King Jayavarman in 12th century. Bayon is also the only temples at Angkor which destined from Buddhism. Bayon was renovated by Hinduism after the death of King Jayavarman. The place is considered as the most impressive temple because of the holy feelings it brings to visitors and its magnificence. Ta Prohm was built since 1186 and is a Buddhist temple and was home to to 12.500 people including 18 priests and 80.000 Khmer people. It is destined for mother of King Jayavarman VII. Ta Prohm was believed to silk, store gold, and pearl. 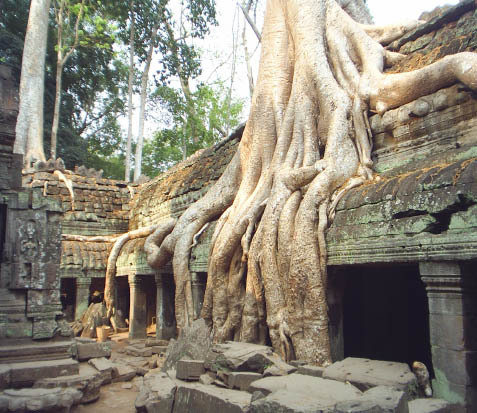 This temple was abandoned and swallowed by tropical forests after the collapse of Khmer empire in 15th century. Banteay Srei located far from the main temples and is one of the smallest temples in Angkor. But the temple itself attracts many travellers for its beautiful carvings and because it was built by pink sandstone. The walls were decorated elaborately with floral motifs and Ramayana story. Located on the top of a hill, was built in the end of 9th century, Phnom Bakheng is the Hindu temple on the mountain. The temple was the architectural center of the new capital during the region of King Yasovarman. It was built in the pyramid form consisting of six floors and faces to the east. Phnom Bakheng consist 108 small towers around the temple and well – known places for sunset watching in Siem Reap. Ta Keo was consider as a private place for Shiva God and was built by the King Jayavarman V when he was 17. But the temple was not finished due to the king’s death. People said that the construction was stopped while the main structure was almost competed and the temple was struck by lightning when it was being built. The temple was built by green sandstone and is the only unfinished temple in Angkor Thom. Takeo is completely different from others grey or brown colour temples in Angkor. Was built in the middle of 13th century by the King Jayavarman VI, Banteay Kdei located in the East of Angkor Thom and the Southeast Ta Prohm. It is the Buddhist pagoda in Angkor and well knows as “The Temple of Buddhism monks’ cells”. Nowadays, the place is crumbled because of the bad quality of sandstone and the construction errors. However, it is being renovated day by day. Before, Banteay Kdei used to be occupied by Buddhist monks in many centuries until the year of 1960. Pre Rup was the second temple was built after the capital was moved from Koh Ker to Angkor. The place look like the miniature Angkor Wat with the three towers in the center. Grey sandstone was the main material to build this temple as it is less durable than pink sandstone like others temples at Angkor complex. The complicated carvings at the temple have been almost damaged because of heavy rain and being abandoned for centuries. Preah Khan was restored many times as others nearby temples. This is one of the biggest temple complexes in Angkor. It was built by King Jayavarman VII as his temporary residence when Angkor Thom was being built. Preah Khan has four entrance, the main entrances are destined for Shiva, Vishnu and Brahma with smaller doorways, emphasizing the inequality of Hinduism while the east entrance is destined for Mahayana Buddhism. Travel tips for Hanoi – What to do in the evenings?